Pummelo scientifically known as Citrus maxima, is native to Southeast Asia (Thailand and Malaysia). Reportedly it was introduced to China around 100 B.C. 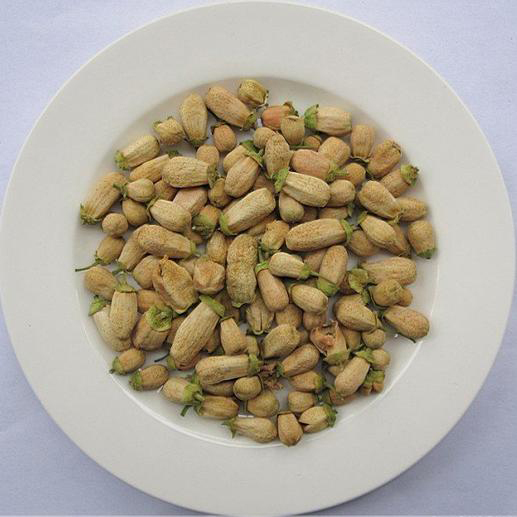 It is cultivated widely in Southern China, Southern Thailand, Southernmost Japan, Taiwan, Malaysia, Southern India, New Guinea, Indonesia and Tahiti. It is believed to have been brought to New World in late 17th century. In the end of 17th century, fruit was cultivated in Jamaica and Barbados. 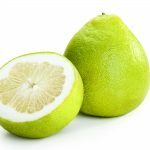 Pomelo is also known as Forbidden fruit, Pomelo, Paradise apple, Shaddock, Pummelo, Citrus Species, Chinese Grapefruit, Pumello and Pamplemousse. 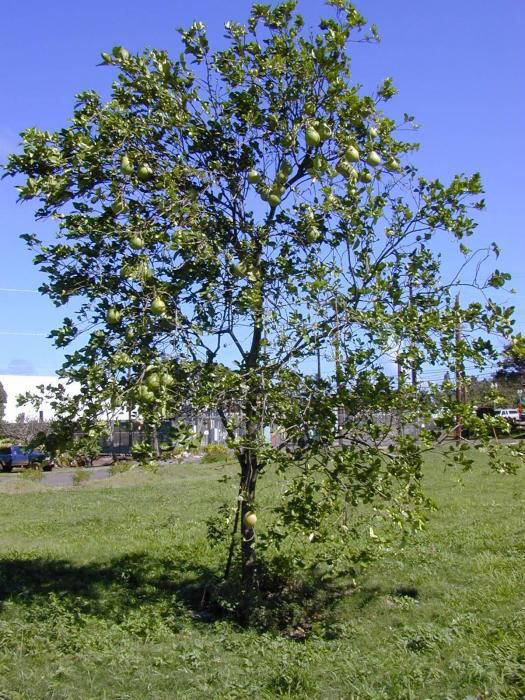 It is the medium sized tree and largest among all species of Citrus bearing large leaves, fruits and flowers. Though pomelos are often confused with grape fruits but it is easily distringuished with their thicker rinds, larger size and mind or sweet flavor. 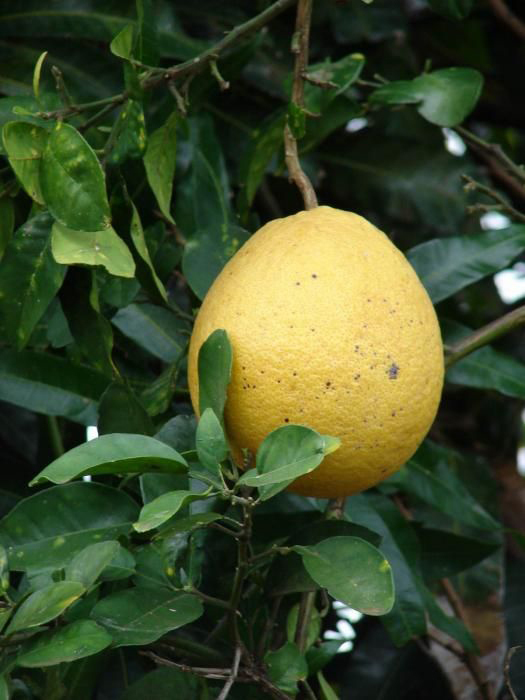 It is the cold intolerant species of citrus which grows upto 15 meters tall with a rounded crown. The tree bears oblong to elliptic leaves measuring 4 to 8 inches long having winged petioles. 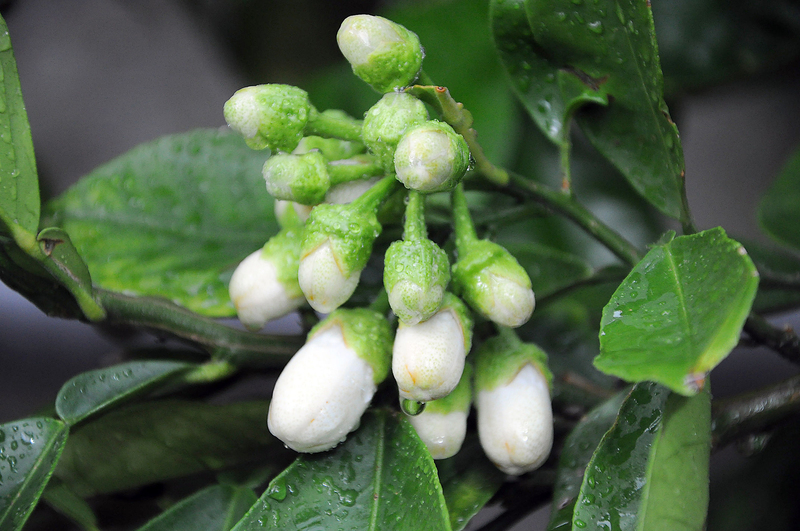 Fruits and flowers are borne singly and grown in 2 to 20 clusters. The shape of the fruit varies from round to pear shaped and ripens to orange, yellow or red. Fruits measures 30 cm in diameter and weighs about 9 kg. The color of the flesh may be greenish yellow, pink, yellow or red and is juicy and divided from 11 to 18 segments. Fruit has sweet to somewhat acidic flavor. The tree thrives in full sun and tropical climates having annual monthly temperatures of 25 to 32°C and rainfall of 1,500 to 2,500 mm with 3 to 4 months of dry period which is found in growing regions of Southern Thailand and Malaysia. It is adaptable to various soils from coarse sand to heavy clay. The tree requires deep, medium textured and fertile soils. Similar to other citrus fruits, pomelo fruits contain high content of Vitamin C. It is generally consumed as fresh fruit. It is widely popular in Asia especially Indonesia, China and Thailand. Juice of Pomelos is used in various beverages and peels are candied. This fruit is traditionally used to treat fevers, coughs and gastrointestinal problems. Aromatic flowers are processed into perfumes in Vietnam and wood are used to make tool handles. Pomelo is a pale green to yellow fruit having sweet white to rarely pink or red flesh and thick rind pith. This large citrus fruit measures about 15 to 25 centimeters in diameter and usually weighs about 1 to 2 kilograms. It has distinctly winged leaf petioles. 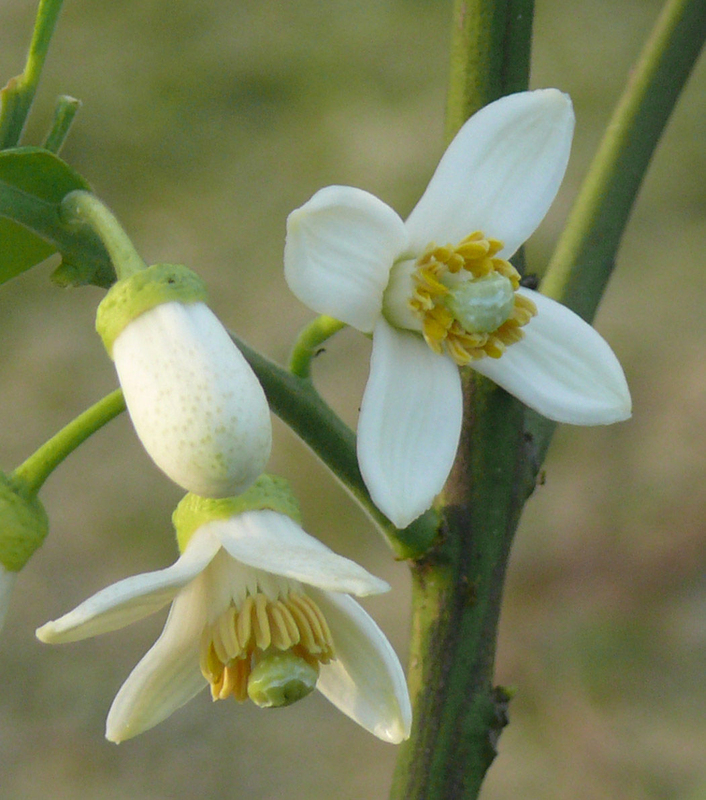 The fragrant flowers are white and crowded in short and axillary raemes. Fruit is obovoid to spherical in shape which measures upto 20 centimeters in diameter. The thick and spongy rind could be removed easily from the segments of fruit. Pulp of the fruit is pink, pale yellow to red. The taste of the fruit is sweet and similar to mild grapefruit. The peel of the fruit is used to make marmalade, candied and also sometimes dipped in chocolate. 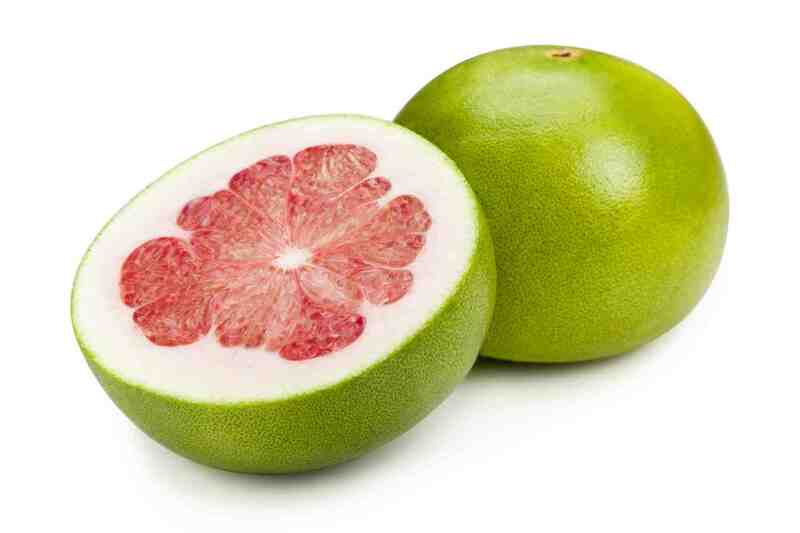 Pomelo is inherent to Malaysia and Southeastern Asia and grows wild on banks of river in Fiji and Friendly Islands. Around 100 BC, it was introduced in China. It is sophisticated in Southern China and in Southern Thailand on banks to the Tha Chine River, also in Southernmost Japan, Taiwan, Indonesia, Malaya, Tahiti and New Guinea. 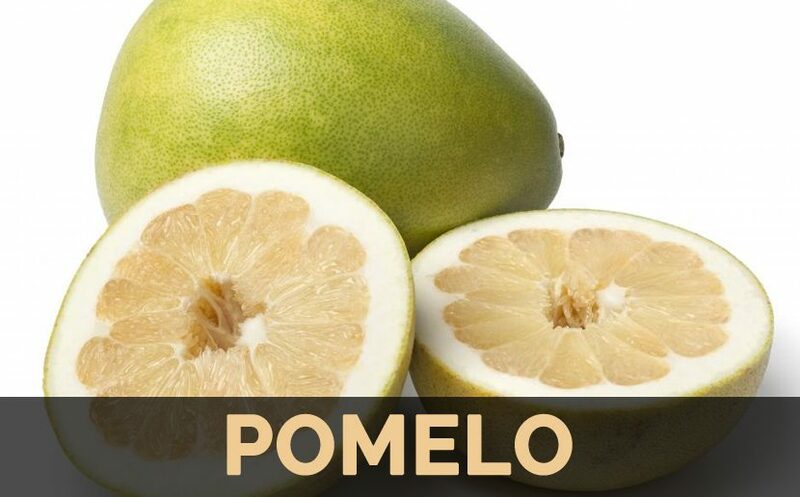 Pomelo is also known as shaddock after Captain Shaddock, an English sea captain introduced the seed in 17th century to West Indies from Malay Archipelago. Fruit produced from seeds are similar but smaller than current grapefruit and much more like an orange. The fruit grow in clusters or bunches like grapes. Pomelos have high content of Vitamin C which is an antioxidant that provides various functions such as healthy gums and skin and is able to promote absorption of iron from meat sources. Pomelos have folic acid and dietary fiber. Folate helps to lower neural tube birth defects during pregnancy and also strengthen healthy blood cells. 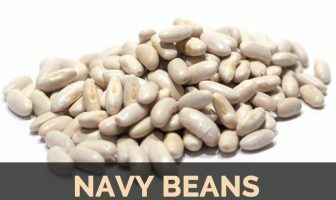 It helps to lower blood pressure, prevent anemia, lower cramping, lower signs of premature aging, strengthen bones, protect heart health, prevent cancer, supports weight loss and promote dental and oral health. Pomelo fruit contains 600% of daily requirement of Vitamin C. It is a major source of ascorbic acid which is used to boost immune system in Southeast Asia. Vitamin C is an antioxidant that promotes of activities of white blood cells and counteracts free radicals that could damage organs of the body. It helps to counteract coughs, colds, fevers and serious symptoms or viral, microbial and bacterial infections. Vitamin C helps to revitalize immune cells as well as antibodies. It could safeguard the body from bacteria as well as viruses that are the cause for common colds and flu which are infectious respiratory tract infections. Fruits have high content of fiber. Pomelo provides 25% of daily requirement of fiber that promotes proper digestion and prevents the chances of diarrhea and constipation. The high content of fiber adds bulk to stool, stimulate secretion of digestive and gastric juices, promotes smooth movement in digestive tract and stimulates secretion of gastric and digestive juices which helps to break down complex proteins that are difficult for digestion. It maintains proper function of digestive system. Pomelos are great source of potassium. Each fruit provides 37% of daily requirement. Potassium acts as vasodilator that helps to release tension in blood vessels and promotes blood circulation and oxygenation of organs. It lowers strain in heart and also reduces the chances of heart attack, atherosclerosis and stroke. Potassium is vital for balancing fluid in the body which is a vital aspect of muscle cramping as well as stiffness. The deficiency of potassium results in face cramps, torn ligaments and pulled muscles. Leg cramping is caused due to unpleasant and unconscious shrinkage of muscles of limbs. Cramps are usually caused due to the lack of fluids and electrolytes such as magnesium, potassium and sodium. Sodium is found in ample amounts in this pomelo fruit. High content of Vitamin C found in Pomelos has antioxidant activities that eliminate harmful free radicals. Free radicals are the cause for degradation of skin that results in signs of premature aging such as sagging skin, winkles and age spots. The high intake of Vitamin C could prevent these problems. It contains spermidine which is a rare chemicals that is found in human sperm. It is closely related to anti-aging properties. Being a great source of Vitamin C, Pomelo fruit is responsible for maintaining healthy teeth as well as gums. The teeth are usually made of soft pulp that is surrounded by hard dentin hat which is covered again with enamel in the crown of teeth. It helps to bite food. Gum is a firm flesh which is around the teeth roots on lower and upper level of jaw. The deficiency of Vitamin C causes bleeding of gums and loose teeth. The daily intake of pomelo makes the teeth as well as gum healthy. It is helpful to counteract bleeding gums because the collagen present in this fruit is useful to create balance and healthy teeth and gums. The bleeding of gums is caused due to deficiency of Vitamin C. It also protects the teeth and gums from bacterial infections. Pomelos contain minerals which is responsible to develop new bones and protect deteriorating of bones. Osteoporosis is the bone related problem that is caused due to lower bulk of bone and thinning of bones. It could also be due to low calcium and small bone protein. It causes lower flexibility and improper posture. The daily consumption of pomelo protects bones and also prevents osteoporosis which makes prone to fractures. It promotes bone health by lowering the chances of getting fragile and brittle bones. Pomelo contains high content of dietary fiber as well as other nutrients which soak and lower sugar and starch from the body that supports weight loss. It is a fruit with low calories and also contains fiber and carbohydrates which keeps the body full for long period of time. Pomelo supports the process of losing weight because foods rich in fiber makes the body feels full for longer time period and thus it helps to lower consumption. It speeds the process of burning fat and limit an accumulation of fat in the body. 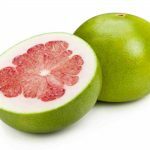 The skin of Pomelo is packed with bioflavonoids that helps to lower symptoms of pancreatic cancer, intestinal tract cancer and breast cancer which is caused due to the multiplication of damaged cells. The regular consumption of fruit skin regularly prevents it from spreading. Moreover, the research found it to be effective for breast cancer. The fruit is rich in Vitamin C that is considered to be a vital ingredient for collagen development which is a protein that makes skin flexible and elastic and promotes the skin to speed up the healing process. It recovers the wound by replacing dead tissues and this procedure occurs immediately after the wound forms. Consume pomelo fruit daily for speed recovery of wounds. Vitamin C is rich in cofactor enzymes that actively takes part in collagen development and enables skin to heal faster. The pomelo is actually the ancestor of the grape fruit. It matured wild in regions of China and its particular origin is probably someplace around Malaysia as well as Indonesia. 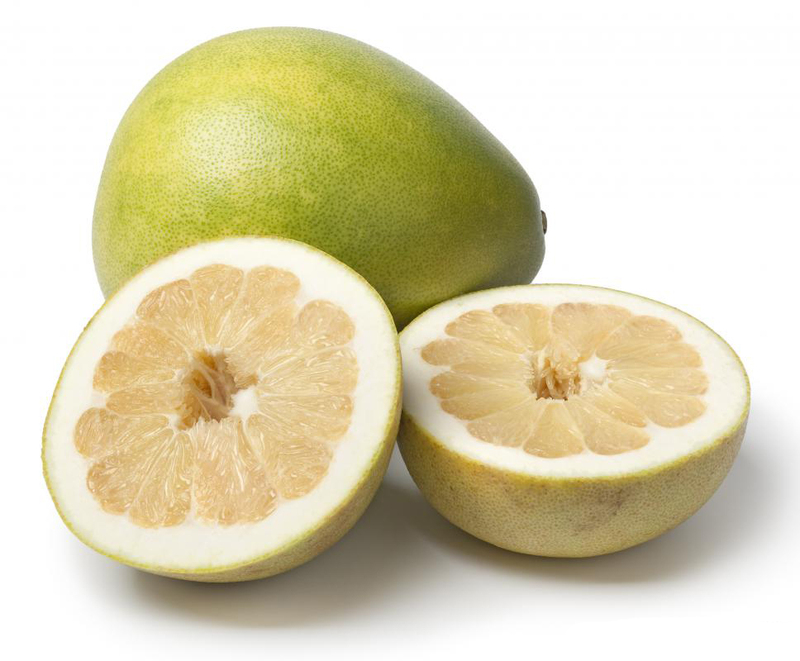 Nowadays, pomelo is grown in the United States of America, Malaysia, Thailand, Taiwan as well as the Fiji Islands. 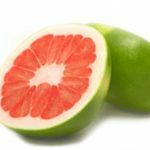 Within the various locations you will discover various kinds of pomelo grown yet on the basis of their flesh colour you will discover about three kinds of pomelo. 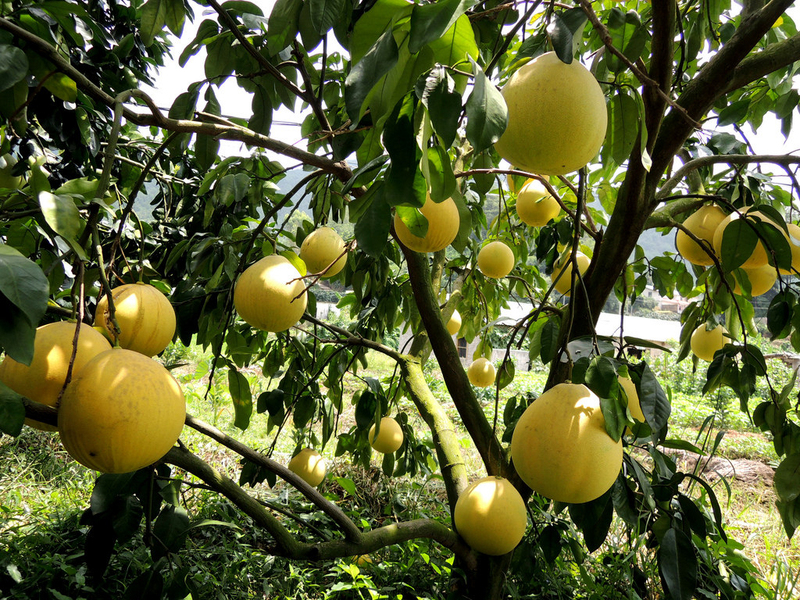 The pomelo tree is really a big furry tree having an abnormal crown developing to about 5 to 15 m tall. The thorny tree has numerous twigs and it also generates fruits throughout the year. Its bark is brown yellow as well as thicker. The foliage is easy and develops to around 2 to 12 cm broad. Oil glands can be found in it as tiny a dot which provides the dark green leaves a gleaming look. Whenever smashed, they provide a a powerful odor. The flowers are usually yellow-colored white or even plain white, aromatic, individual as well as grow to about 2.5 cm broad. The pomelo is definitely the ancestor of the grape fruit. Just like grape fruits, pomelos vary significantly in color, shape and size. They vary from cantaloupe-size to as huge as a 25-pound watermelon and also have extremely thicker, gentle skin that may differ in color from yellow to pale yellowish-brown to pink. The light yellow to coral-pink flesh may differ from succulent to somewhat dry as well as from seductively spicy-sweet to tangy as well as sour. 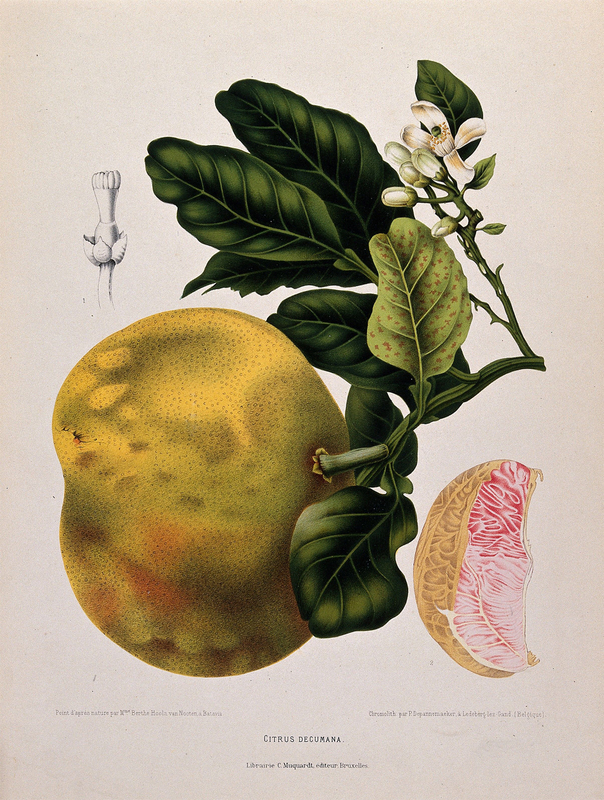 Pomelo’s medical title is Citrus grandis. The pomelo is additionally known as Chinese grape fruit, shaddock, pumelo, pommelo, as well as pompelmous. The pomelo is additionally known as shaddock right after an English sea captain exactly who released the seed towards the West Indies. The French term for this particular fresh fruit is chadec. Select fruit which is hefty because of its dimension, blemish-free as well as softly great smelling. Keep within the fridge for approximately a week. Pomelos can be utilized in any way ideal for grape fruit. They are loaded with vitamin C as well as potassium. There are actually three types of the pomelo i.e. Belonging to the Citrus Grand is family; the Israeli variety of the Pomelo is actually a exclusively huge fruit, described as huge juice saccules, extremely thicker peel, sweet pulp as well as exclusive odor. 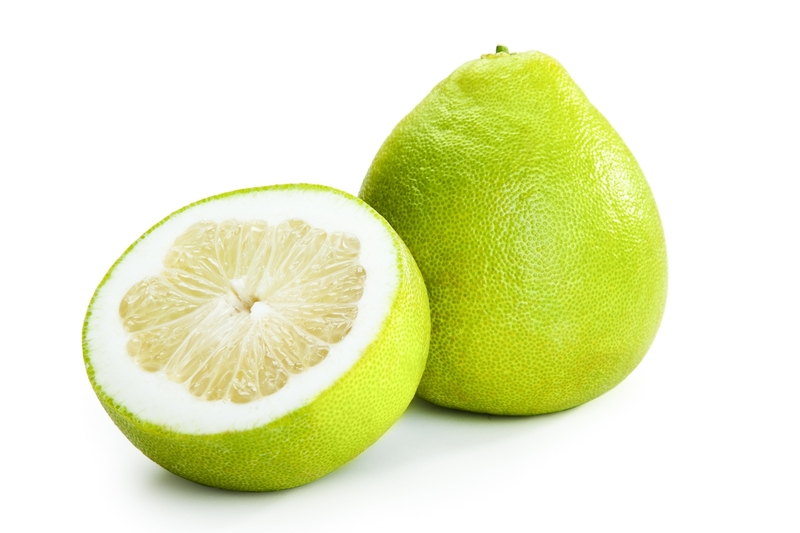 White pomelo is usually offered as treat which will help in the digestion of food. The Pomelo is collected in between mid-October as well as mid-May. Red pomelo has got softer as well as thinner-skinned variety. The Red Pomelo is good, tangy, as well as sour, compact along with pink pulp along with a a little more compacted design. This massive citrus fruit, abundant with vitamin c as well as potassium, is really an indigenous of Malaysia and is also thought to be the ancestor of the grape fruit. The Israeli-grown Red Pomelo ripens in between September as well as January. 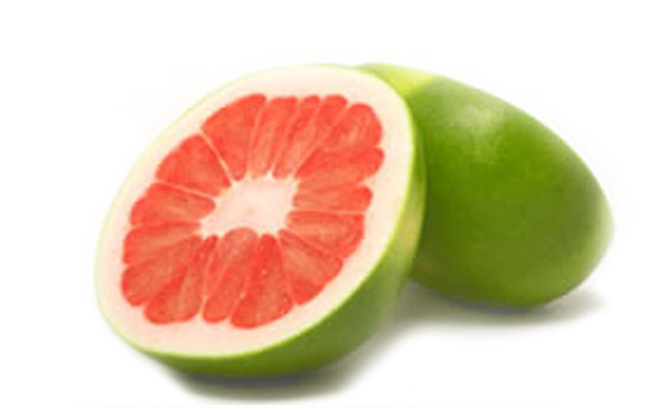 Pink pomelo consists of numerous seeds and is also so sweet as well as juicy. The pink pomelo can also be regarded as the remedy for stomach or even the intestinal worms. In Southeast Asia and Philippines, decoction made from flowers, leaves and rind are used for chorea, epilepsy and convulsive coughing. Decoction prepared from hot leaf is applied for ulcers and swellings. Seeds are useful for dyspepsia, coughs and lumbago. In Brazil, gum which is exuded from declining trees is used as a remedy. Leaves are used as aromatic baths in Philippines. Juice extracted from fruit is used for ulcers, diabetes and mix with rock salt and black pepper for malaria. The pulp with honey helps to enhance urinary flow. In Nigeria, fruit is used for upset stomach, arthritis, gout, ulcer and kidney stones. In Taiwan, it is used to promote circulation of blood and remove blood stasis in diseases. This fruit is used for treating heart problems and stomach ailments. Fruit pulp is used as a stomach tonic and appetizer. The juice of the fruit is effective in lowering weight and also promotes reduction in cholesterol. 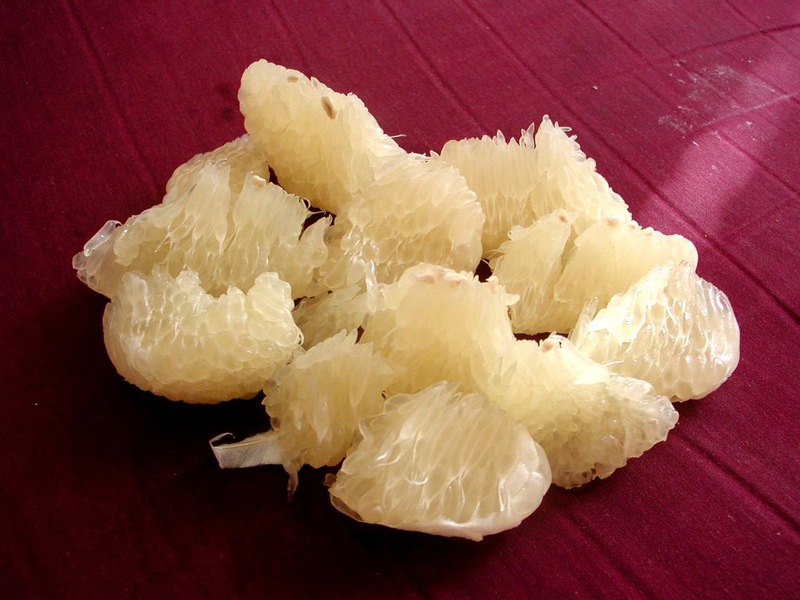 The peel of pomelo is used for beauty purposes. 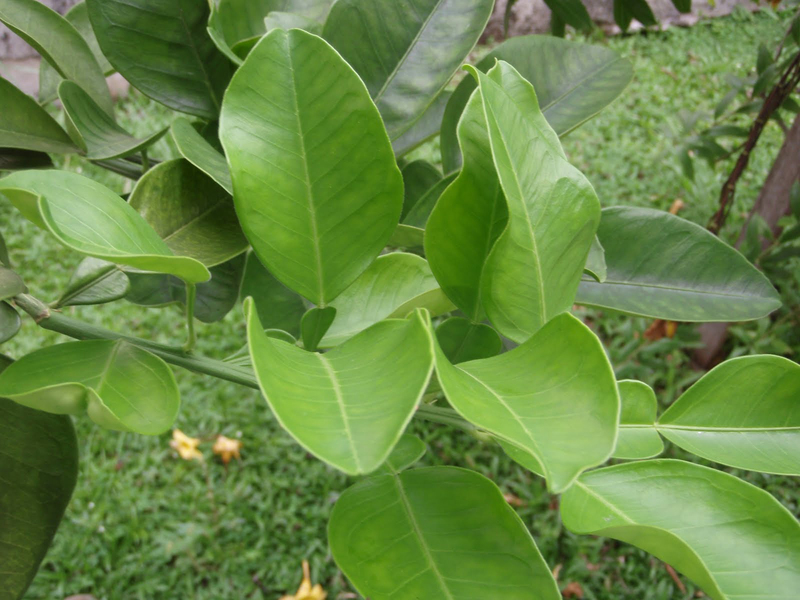 Leaves are used for treating chorea, epilepsy, convulsive cough and stomach pain caused due to indigestion. Rinds are used as a sedative in nervous affection, vomiting, diarrhea, griping of abdomen, eye troubles and headache. Use the hot leaf decoction for ulcers and swellings. In Malaya, painful swellings are treated with the lotion of boiled leaves. It makes the bowel movements easier. Boil four slices of pomelo without peel with 12 grams of astragalus and drink this mixture two times a day to provide relief from cough. Boil the peel by adding sugar which provides relief from gas pains. Heat the pulp of pomelo with rock sugar and take it three times in a day to provide relief from minor cough. The daily intake of pomelo provides relief from sore throats. Prepare pomelo and rice like a soup and take it three times in a day to provide relief from abdominal pains and indigestion. Cure frost bites with the use of boiled peels. Boil 3 to 10 grams of dried pomelo leaves and drink it once a day to treat diarrhea. Apply the drops of crush fresh pomelo leaves to the infected ear by curing ear infections. This fruit is rich in potassium and Vitamin C which is harmful for the patients with kidney and liver problems. The hypotension patients should avoid it because pomelos reduce the blood pressure considerably. 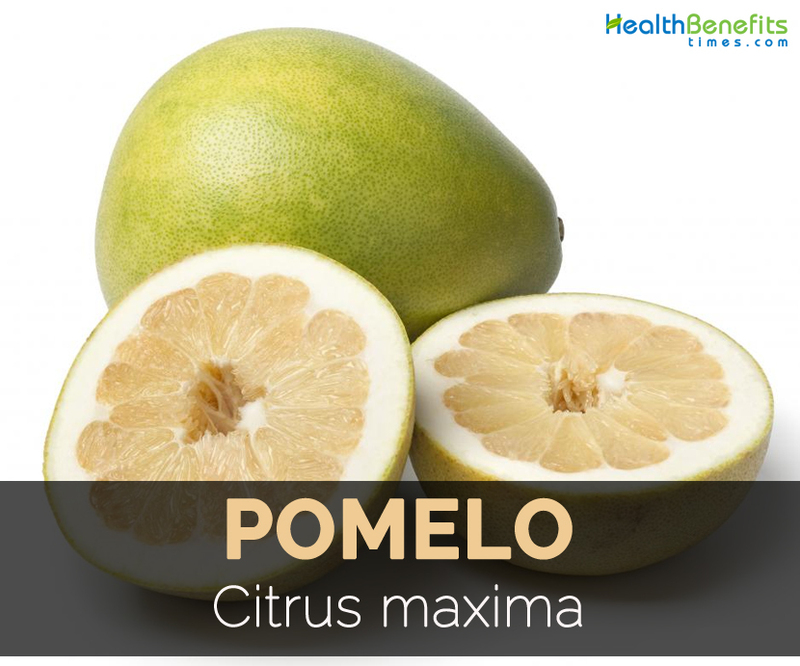 Limit an intake of pomelos because excessive consumption could result to various health problems. People allergic to citrus fruits should avoid it. Consult the health practitioner for using it to treat health problems. If consumed excessively it results constipation and formation of kidney stones. Ripe and sweet pomelo is consumed fresh or made into juice, marmalade and beverage. Skinned segments are used in desserts, salads and made into preserves. The rind could be preserved by drying and salted as well as candied. Dried or fresh rinds are used as an ingredient in soup and cooking meat stews. Its essential oil is used as flavor ingredients. Leaves are used to flavor fish and meat dishes. In Taiwan, dried leaves are brewed in water as a drink. The juice is used in various beverages. It is added to fruit salads. An essential oil could be extracted from p eel and used as a flavoring agent for sweets, chewing gum, soft drinks, ice cream and baked goods. From seeds, we could obtain oil. In Southeastern Chinese cuisine, pomelo juice is used to add flavor to desserts and soups. The fruit pulp is also used to prepare jellies, jams and syrups. Again boil the water and add chicken. Turn off the heat when the bubbles form at rim. Cover it and let is remain for about 20 minutes to cook flesh. Then remove and set it aside to cool. 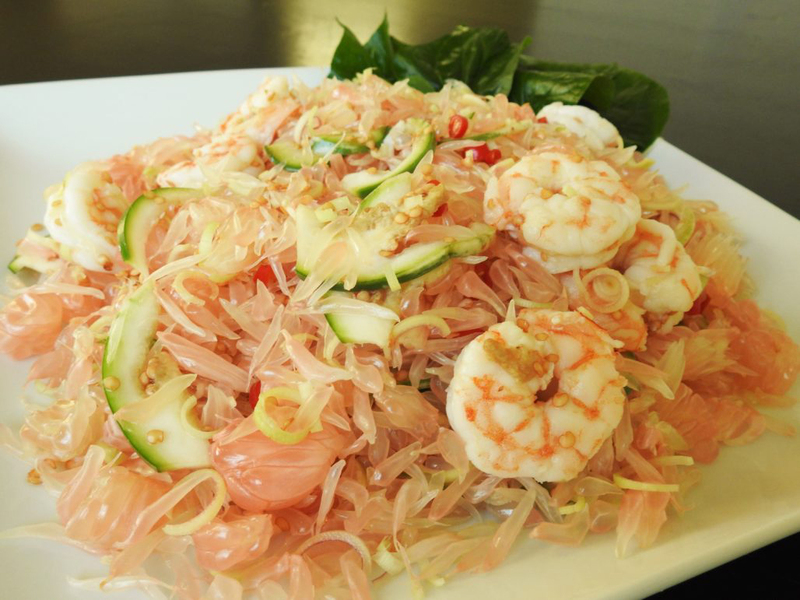 Cut shrimp diagonally into large pieces so that it will blend well with other ingredients and pomelo. Speck the chicken and set it aside. 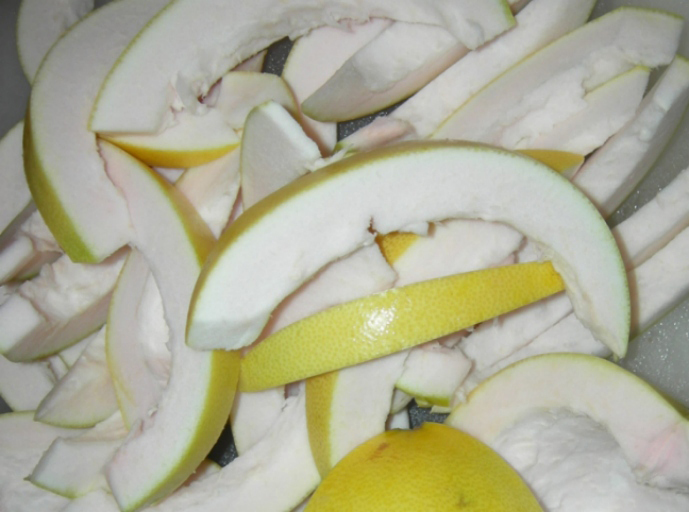 Cut the ends of pomelo then cut off skin as well as pith to expose pinkish flesh. Use knife, scissors or fingers to peel the flesh from its skin. Separate flesh into bite sized pieces and put it in a bowl. For dressing, mix lime juice, fish sauce, sugar, water, chile and garlic in a small bowl. Stir it to dissolve sugar. Add chicken, shrimp, mint, carrot, macadamia nuts, cilantro, mint and fried shallot to pomelo. Toss it with fingers to mix it well. Toss by adding dressing. Adjust the flavors as need. Put it to a plate leaving liquid behind and then serve.